We never had any occasion when we were separated from Krishna. For example, when a man is dreaming, he forgets himself. In a dream he creates himself in different forms—“Now I am the king.” This creation of himself is as two things – 1) as the seer, and 2) as the subject matter, or seen. As soon as the dream is over, the “seen” disappears, but the seer remains; now he is in his original, awake position. Our separation from Krishna is like that. We dream this body and so many relationships with other things. First the attachment comes to enjoy sense gratification. Even [when we are] with Krishna the desire for sense gratification is there. There is a dormant attitude for forgetting Krishna and creating an atmosphere for enjoying independently. At the edge of the beach, sometimes water covers the sand, and sometimes there is dry sand; the ocean is coming and going. Our position is like that, sometimes covered, sometimes free, just like at the edge of the tide. As soon as we forget, immediately illusion is there; just as when we sleep, a dream is there. We cannot say, therefore, that we are not with Krishna. As soon as we try to become the Lord, immediately we're covered by maya. Formerly we were with Krishna in His lila, or sport. But this covering of maya may be of very, very, very, very long duration; therefore [in the interim] many creations are coming and going. Due to this long period of time it is sometimes said that we are ever conditioned. But this long duration of time becomes very insignificant when one actually comes to Krishna consciousness. In a dream, we may think a very long time is passing, but as soon as we awaken we look at our watch and see it has been only a moment. Another example is how Krishna’s friends were kept asleep for one year by Brahma, but when they woke up and Krishna returned, they considered that only a moment had passed. This "dreaming" condition is called non-liberated life. It is just like a dream. 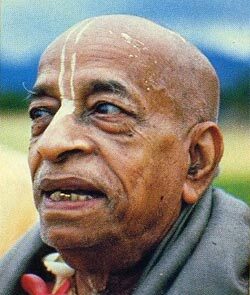 Although by material calculation it is a long, long period, as soon as we come to Krishna consciousness this period is considered a second. Jaya and Vijaya had their lila with Krishna, but they had to come down [to the material world] for their little mistake. * They were given mukti, merging into the Brahma-sayujya [Lord Krishna’s impersonal effulgence], after being killed three times as demons. This Brahma-sayujya mukti is nonpermanent. Every living entity wants pleasure, but Brahma-sayujya is lacking in pleasure; it consists only of eternal existence. So when those who get Brahma-sayujya mukti do not find transcendental bliss, they fall down to make a compromise with material bliss, for example, by founding schools and hospitals. Even Lord Brahma is still material and wants to lord it over the material world. He may come down to become a germ, but then he may rise up to Krishna consciousness and go back home, back to Godhead. This is the position. So when I say yes, there is eternal lila with Krishna, that means on the evidence of Jaya-Vijaya. Unless one develops full devotional service to Krishna, he goes up only to Brahma-sayujya but falls down. But after millions and millions of years of keeping oneself away from the lila of the Lord, when one comes to Krishna consciousness this period becomes insignificant, just like dreaming. Because he falls down from Brahma-sayujya, he thinks that this may be his origin, but he does not remember that even before that, he was with Krishna. So the conclusion is that whatever may be our past, let us come to Krishna consciousness and immediately join Krishna. It is a waste of time for a diseased man to try to find out how he has become diseased; better to spend time curing the disease. An Allegory . . .
On the top of a tree* there was a nice tal fruit. A crow went there and the fruit fell down. Some panditas—big, big learned scholars—saw this and discussed: “The fruit fell due to the crow agitating the limb.” “No, the fruit fell simultaneously with the crow landing and frightened the crow so he flew away.” “No, the fruit was ripe, and the weight of the crow landing broke it from the branch.” And so on and so on. What is the use of such discussions? So whether you were in the Brahma-sayujya or with Krishna in His lila, at the moment you are in neither, so the best policy is to develop your Krishna consciousness and go there [back to Godhead]—never mind what is your origin. *The tal-fruit tree is the palmyra palm. Brahma-sayujya and Krishna-lila—both may be possible. But when you came down from Brahma-sayujya or from Krishna lila, that remains a mystery. But at the present moment we are in Maya’s clutches, so now our only hope is to become Krishna conscious and go back home, back to Godhead. The real position is servant of Krishna, and servant of Krishna means in Krishna lila; directly or indirectly, we are always serving Krishna’s lila, even in dream. Just as we cannot go out of the sun when it is daytime, so where is the chance of going out of Krishna lila? The cloud may be there—the sky may become very gray and dim—but still the sunlight is there, everywhere, during the daytime. Similarly, because I am part and parcel of Krishna, I am always connected with Krishna. My finger, even though it may be diseased, remains part and parcel of my body. Therefore, we try to treat it, cure it, because it is part and parcel. So Krishna comes Himself when we forget Him, or He sends His representative. Awake or dreaming, I am the same man. As soon as I awaken and see myself, I see Krishna. Cause and effect are both Krishna. For example, cotton becomes thread, and thread becomes cloth. Still, the original cause is cotton. Therefore, everything is Krishna in the ultimate sense. When we cannot contact Krishna personally, we contact His energies. There is no chance to be outside Krishna’s lila. But we see differences under different conditions. To give another example: In the pool of water and in the mirror the same "me" is reflected, but differently; one is shimmering – unsteady - and one is clear and fixed. Except when we are in Krishna consciousness, we cannot see our actual position rightly; therefore the learned man sees all living entities as the same parts and parcels of Krishna.